More than 2,000 children are scalded each year in North America, mostly in the bathroom and kitchen. Unwanted temperature fluctuations are an annoyance and a safety hazard. When a toilet is flushed, for instance, cold water flows into the toilet’s tank and lowers the pressure in the cold-water pipes. If someone is taking a shower, they will suddenly feel the water become hotter as less cold water is available to the shower valve. By the same principle, the shower water will become colder when someone in the house uses the hot-water faucet. This condition is exacerbated by plumbing that’s clogged, narrow, or installed in showers equipped with low-flow or multiple shower-heads. A sudden burst of hot water can cause serious burns, particularly in young children, who have thinner skin than adults. Also, a startling thermal shock – hot or cold – may cause a person to fall in the shower as he or she scrambles on the slippery surface to adjust the water temperature. The elderly and physically challenged are at particular risk. Anti-scald valves mitigate this danger by maintaining water temperature at a safe level, even as pressures fluctuate in water supply lines. They look similar to ordinary shower and tub valves and are equipped with a special diaphragm or piston mechanism that immediately balances the pressure of the hot- and cold-water inputs, limiting one or the other to keep the temperature within a range of several degrees. 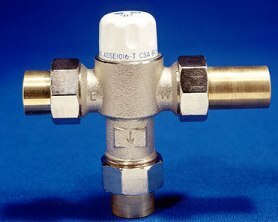 As a side effect, the use of an anti-scald valve increases the amount of available hot water, as it is drawn more slowly from the water heater. The actual temperature of the water that comes out of the fixture may be somewhat different than the target temperature set on the anti-scald valve. Such irregularities may be due to long, uninsulated plumbing lines or defects in the valve itself. Users may fine-tune the valve with a rotating mechanism that will allow the water to become hotter or colder, depending on which way it’s turned. Homeowners may contact an inspector or a qualified plumber if they have further questions or concerns.